The news has spread like wildfire from Sunday night through social networks and through other means, including non-sports. So much so that Lionel Messi, the star of the Argentina team guided last monday to his country to win on the combined Bosnia, had to appear publicly to clarify a situation. Since last Sunday, began circulating pictures and a video of an incident in which a child was left with hand tapered waiting greeting Messi, who apparently did not notice the small and instead proceeded to hello to one of the referees who officiate the game. Minutes before the game, the player goes to the exit tunnel to the stadium when he meets the referees and the children who accompany him to the ground. The front says goodbye to the children. 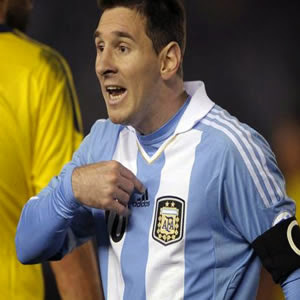 Little extends his hand but not Lionel Messi salutes and continues walking towards the referees. Lionel Messi did not cause Such a stir on social networks with his goal, but if the child slip greeting. However, a day later, he came out clarifying the situation in a short interview for Fox Sports. "Actually yes, because they were talking about so many things. Like I'm going to get (the body) to a baby. Moreover, after the row, I got to talk to two kids beside me and laugh with them. I felt bad (for the news) because nothing to do ... I have nephews, son, and I do not do such a thing, " said the player. According to the video what is your opinion?